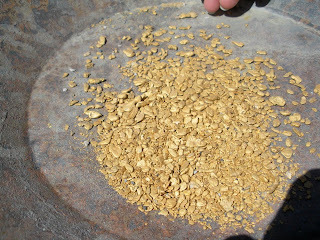 Rob Towner's Official Gold & Diamond Mining Technique Blog: Gold nuggets an the end of the day!! All of the gold in this deposit was on bedrock. We mined about 7 acres and had plenty to smile about. Gold like this does happen out there. After we would finish a cut I would go over the cleaned bedrock with a metal detector and never ever found a stray nugget. Thought I'd share a good gold photo.